← Can’t BEAT This Breakfast! This is another recipe that Jewel chose from The Primal Blueprint Reader Created Cookbook, and it was another great choice! I’m sorry that I didn’t take more pictures of the preparation. I was so hungry that night that I didn’t think about it. The important thing to keep in mind about this recipe is that the pork needs to marinade for at least 2 hours before you cook it. I frantically cut up the pork and had Jewel throw together the marinade before she had to go to school and I had to go to work. That evening I concentrated on frying up the pork and Jewel was in charge of the pesto. We used 1/2 cup of coconut milk and did not use honey. The next day the sauce was thicker but still soft. It tasted good on everything, included the steamed cauliflower I ate the first night we had it. I fried the pork in bacon grease. I see so many recipes that call for olive oil for high heat cooking, but olive oil should only be used in low heat cooking. Dora doesn’t usually like pork tenderloin, but I dubbed this “bacon pork” and she gobbled it down. She even requested it for leftovers the next day! 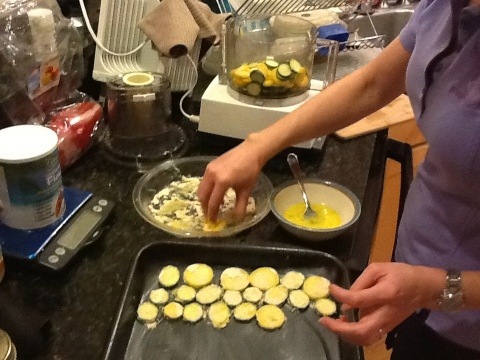 The following evening I made a side dish Jewel had requested from the same cookbook, zucchini chips. Of course I did the fast version since it was a week night. 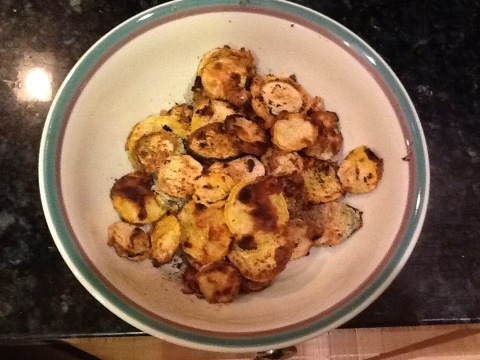 Dredge sliced zucchini in an egg and then coconut flour. The food processor makes short work of slicing. 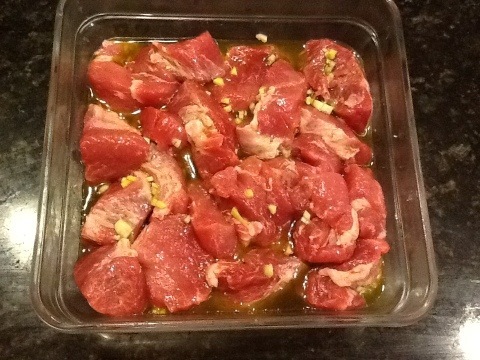 Place on baking sheet or broiler pan. These were yummy. Even Tom liked them, and he doesn’t usually like zucchini. 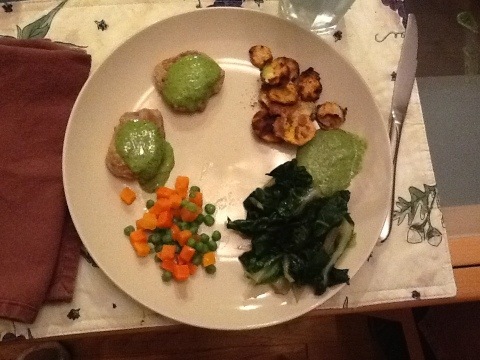 My meal also included Swiss chard and peas and carrots.